Masterpiece of a book! It keeps you glued to the pages wanting to keep reading! It is truly an escape from real life! M J Rose is a master story teller in my book! I'm in love with her story telling skills! Okay, you've been told you are not supposed to judge a book by it's cover, but how can you possibly NOT judge this one? You can't! It's GORGEOUS! The whole cover is enticing! All of M J Rose's books in this series have beautiful covers, but this one is definitely enticing! Although, she has the book prior to this one called Seduction, and the necklace on that cover, WOW! For this book, put aside ANY beliefs you may or may not have about reincarnation, magic, spells, lotions and potions, because it is SO GOOD! It requires a little bit of belief, so that little bit of doubt in your mind, allow it to come to the surface and be open to it! Besides, this book romances you into this time and you do believe as you are reading it. Don't pass this one or her others in this series up! 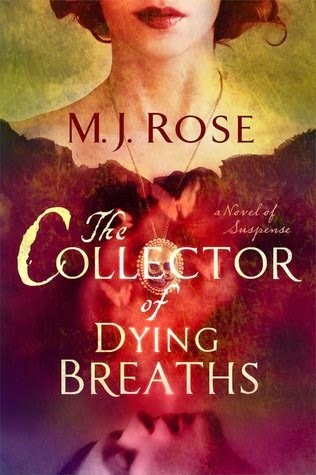 The Collector of Dying Breaths, A Novel of Suspense, Book #6 in the Reincarnationist Series is the book I will be reviewing here today. This book is OUTSTANDING! This book can be read as a stand alone, as I have read it, despite my owning the entire series! You ask why haven't I read the entire series? I didn't put two and two together that this was a series , which I'll list all of the books in the series at the end of this review. I didn't catch these were a series, nor did I realize I owned them all except for one book, Seduction, Book 5, but now I own it! I have the Kindle Keyboard, (an older version of the Kindle now!) which you cannot see the covers in it nor can you group books together 'easily', which is why I must have missed it. (I have 15 pages of titles on my Kindle! It's easy to miss books!) I'll have to watch my books closer. This book, just like the previous book I just mentioned, and all of her books in this series have the appeal of my LOVE of the Renaissance times, (probably the fairy tale versions, no doubt!) That era of time does captivate me. The making of perfumes, using essential oils and real flowers of the time for many different things as they did back in that time period to today, still. Yes, when it comes to reading historical fiction, this is one of my favorite times to read about! I fell in love with the renaissance era from all the different books, King Arthur, to be exact, the movies and the mini-series on TV, the magic and witches they believed in and that love used to send me to the renaissance festivals they have. I 'had' to read this book after reading the description, and once I started, I could not get enough of it. This book goes back and forth between the past in 1573 and the present. It starts in the Renaissance period, when Catherine de Medici, the last wife of King Henry, who, from France, went over to Italy and brought over, who grew up an orphan, Rene' le Florentine, who apprenticed under a monk, Dom Serapino. He taught Rene' everything he knew about elixirs, perfumes, using flowers and plants to make many different things, from perfumes to poisons. One thing in particular this monk was obsessed with was wanting to capture that 'one last elusive exhalation, that last dying breath of a person in hopes of releasing it into another living body reanimating their soul, bringing them back from the dead'. Did it work? No spoilers from me! This was practiced by him quite a bit. So Rene' is to be Catherine's Perfumer. It is required Rene' make a fragrance just for her, one in particular to help King Henry be completely attracted to her (today we would call this pheromones) so he could not resist making love to her above any other woman in his concubine. This scent was more than needed because she was required to bring children into the Royalty, and in order for her to continue to be Queen, children were a requirement. Up until now she had been barren. She could very easily be removed from this role of Queen if there are no children to carry on the royalty. Catherine de Medici is still having great difficulties getting pregnant, so it is up to Rene' to spin his spells and make a special concoction unique to only Catherine, to make an essence King Henry cannot resist her sexually with. He would only want Catherine and none of the other women in his concubine. She hopes to have a son for King Henry who will follow in his footsteps as King. Does this work? NO spoilers from me! Women and men come from all over to get Rene's perfumes from him. Rene' later prides himself that if it were not for him and his shop, there would never be perfume in Paris then, and into the future. At other times, Rene' made poisons commissioned by Catherine de Medici that were not necessarily used for the greater good, which did upset Rene' at times, until he finally felt he may have a need to use them later, too. Rene' never married, nor was there a mention about a woman, until . . . he finally met one whom he fell madly in love with, but . . . that's all I'll say about that because I don't want to spoil it! You read it! Present day: Jac L'Etoile, (Jacinthe, named after a flower, a hyacinth) is a mythologist by trade, also a historian and perfumer with her brother Robbie who only just turned thirty a few, mere, weeks ago, and now he is dying, or struggling to stay alive, and Jac is trying to help keep him alive as he is dying, but he is dying quickly. It was only a few days ago he was in the hospital, and modern medicine had not been able to figure out what is wrong with him, and she thinks he has been poisoned, but how does she prove this? She doesn't know how, but she sees three old bottles of something next to his bed. He tells her to go to but she truly believes something is wrong along these lines to Robbie. Did Robbie come across something in the hundreds of year old bottles he had been working with in France? If so, where was he working with them? Was he here at home, or was he in France? What is happening? Robbie tells her to go see a woman, Melinoe Cypros, in Barbizon, France, to get his books, their grandfather's books, but he keeps coming in and out of consciousness. Is he falling asleep? Is he still alive is what she is afraid of. He comes back to and tells her she needs to finish his work with her. What work is he talking about? Who is this woman he was working with? If Robbie was in France, why would he have been? She had so many unanswered questions. He seems to think she knows what he has been doing but she does not know a thing as she was only just informed about her brother's condition within a day or two ago. They had always been extremely close, but there were times when the other did not know what the other was doing, and this was one of those times. Okay. Now Jac is really confused, but thinks she knows what he is referring to. Jac has visions, not only of herself, but of other people, too, people she knows and people she does not. These bothered her very much. Robbie just wanted her to accept it, but she could not. She would try to shake them off. Even after meeting with her mentor, reincarnationist, Dr. Malachai Samuels, there was evidence she could see these visions, but no matter what Jac tries to do, she cannot stop them. She learns techniques to deal them with, but it doesn't really work for her. Jac goes to see Melinoe Cypros in Barbizon, France. She is extremely eccentric, as is the castle she lives in along with the belongings. She also meets a man named Serge. They are going to eat dinner, and Serge suggests they go down to the wine cellar to look for the perfect bottle of wine to go with dinner. They went through a series tunnels full of twists and turns, narrow hallways, larger ones, and some they could barely fit through. Finally they were in the wine room. She starts to have a vision, but pushes it away with the techniques she learned. It comes back. She is reaching in to grab a bottle of wine and thought she felt something move. She pulls her hand back. She puts her hand back in in a different place, and the wall behind the wine moves again. Serge was shocked and wants to know what is going on. Jac and Serge push the wall and they see what looks like an old perfumers work area that opens up. They believe they just found where Rene' le Florentine may have worked his magic. Next comes Melinoe wanting to know what they are doing. She is awestruck and wanting to know how they found what they did. She wants in there, but Jac urges caution. Jac finds journals Rene' wrote during that time holding all kinds of things about perfumes, concoctions and more. She also finds bottles of collected last breaths, and again, more history, it doesn't stop. Just a little while later, Jac's estranged lover shows up, Griffin North, a linguist, and the two of them start to go through Rene''s journals and notes that just might hold the secrets to immortality after all as Griffin starts translating what he wrote. Do sparks reignite between the two of them while working together? Perhaps . . .
M J Rose has woven a story of awe, mystery, of danger, of amazement and most of all, intrigue. There is no turning back from here. Now you cannot stop reading this story it is so magical! You'll be flipping the pages non-stop until the book is finished! I did! I don't know how many more volumes will be in this series, but I want a LOT more! I received this book for FREE from the Publisher, Simon and Schuster and NetGalley in exchange to read and write a review about it. It is NOT required for this review to be either positive or negative, but of my own honest opinion. "Free" means I was provided with ZERO MONIES to read this book nor to write this review, but to enjoy the pure pleasure of reading it. I am disclosing this information in accordance with the Federal Trade Commission's 16 CFR, Part 255, http://www.access.gpo.gov/nara/cfr/waisidx_03/16cfr255_03.html Guides Concerning the Use of Endorsements and Testimonials in Advertising. 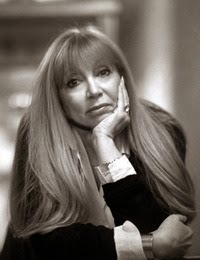 M J Rose has written a lot more books to this series, and another series of books she has written which can be found by clicking on Goodreads. Find her on Twitter HERE!